I’m obsessed with vintage items. Whether it be for my home or my wardrobe, finding just the right vintage piece makes me smile from ear to ear. And while I like to call those items “vintage,” they are really just plain old, but with a ton of character. I like to think about who owned them before me, and what story they have behind them. For example, I have a very old teapot in my home. It doesn’t look like much but it has quite a story behind it. From what my parents told me, my grandfather bought the teapot for my grandmother as a wedding gift when they said “I do.” My mom hung on to it for years after my grandmother passed away, and when I got my first apartment in Florida, that was the first family heirloom I received. I think that is the first time I started to love old pieces. There is just something about an item with history that adds such character to a modern home. And right now, I’m on the hunt for a few more things to add to my home decor. 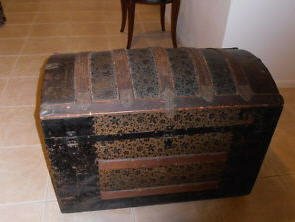 The first is a steamer trunk. When I mentioned this to PoppaNut, I think he thought I was crazy. What in the world would I do with a steamer trunk? Well, I think it would be the perfect spot to put my family quilts in … and we have the perfect little nook in our master bedroom that is dying for a bit of character. So, I’m going to continue looking for that perfect one on eBay. 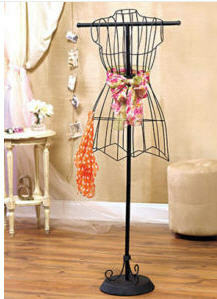 The next thing on my wish list is a vintage wire mannequin. There really isn’t a place for it in my house at the moment, but I think it would be awesome if and when I get an office at work. I just love the romantic feel it gives off, and I would have so much fun dressing it up from time to time. The last item that I’m after is a vintage typewriter. Since writing has always been a passion of mine, I’m just dying for one of these. My friend Erika has one in her house, and I just gushed over it when I saw it. I would put this above the cabinets in my kitchen if it arrived at my house today. I also received a special bracelet years ago from my very first editor, Denise Gee, that was made from the keys of an old typewriter. 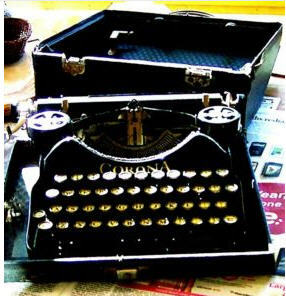 It was such a fond gift to receive from my mentor that I always think of her when I see an old typewriter too. And that’s life in a nutshell … finding the perfect old items to add to your home décor can add character and a sense of nostalgia. What old items are you dying to add to your home? What antique shops in Safety Harbor? I haven’t been to the flea market in a long time, but I would certainly go to find one of these!!!! I’d be happy to go with you!